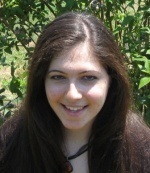 Note from James: This is a guest post by Leah Fisch of Leah4Sci.com , an online resource for learning organic chemistry, MCAT preparation, and other science topics . This is an epic, comprehensive post on organic chemistry IUPAC nomenclature. You might want to bookmark this page for future reference, and be sure to visit Leah’s Youtube Channel for more videos on nomenclature as well as other organic chemistry topics. Leah also tutors MCAT and organic chemistry. Her tutoring page is here. As an organic chemistry student, organic chemistry IUPAC nomenclature will be one of the first topics you encounter. But just because it comes first, doesn’t mean that you can simply tackle it and move on. Learning how to name organic compounds is the foundation upon which your entire organic chemistry knowledge will be based. Much of organic chemistry is about reactions, mechanisms and products. But you will be asked about nomenclature every step of the way. Knowing how important your naming skills are to this course, you need to come up with a simple yet logical approach to naming even the most complex organic compound while taking into account all the different molecular prefixes, chain types, substituents, functional groups and more. If I told you that I met a woman with a 4-part name and asked YOU to put the parts in order, I bet you’d get it on the first attempt. Does your attempt look like this: Miss Jane Doe Jr ? How did you get it right on the first shot? I’m guessing it’s because you have an inherent understanding of the human naming system. We all have a first and last name. Some people have a prefix such as Miss, Doctor or Sir. And so your simple approach is as follows: When you come across a complex molecule with multiple components to name, identify each one individually. Put its name on a list then view the list items as a puzzle that must be put together in a logical sequence. When learning and practicing nomenclature you will find yourself drawing molecules over and over again. While Lewis structure may appear easier to read at first, you may put your sanity at risk having to draw out hundreds of C, H, and O atoms. Instead, I recommend that you get used to drawing in line structure – also called skeletal structure or bond-line notation. This method is both faster to draw and easier to read. This entire tutorial will be illustrated in line structure. If you are not yet familiar with this method then I urge you to study the short video below. Let’s refer back to Miss Jane Doe Jr. While she has four parts to her name, you can easily get away with just referring to her as Jane Doe. This is her ‘core’ name or her ‘parent name’. The core skeleton of an organic compound is called its parent chain. This refers to the simple skeleton or backbone of the molecule, upon which all the functional groups and substituents are attached. This is the first component to name and identify. The parent chain is the longest continuing carbon chain in a molecule (there are some exceptions). Sometimes the parent chain will be written in a simple manner and sometimes the chain will wind and twist. But as long as the carbons are connected, one to the next, to the next, this is considered the parent chain. The highlighter trick is a trick to help you determine if a chain is continuous or not. Place your highlighter at the very start of the molecule. Without lifting the highlighter, trace over every connected carbon. If you have to lift the highlighter to reach another carbon, then it’s not part of the parent chain. Count the number of carbon atoms after identifying and highlighting your parent chain. I recommending actually numbering your molecule. This is a good habit to develop NOW as it will provide a reference point later on when you have to name multiple substituents and functional groups. Now that you have a first name, you need a last name too. The last name comes from the saturation of the parent chain, specifically the presence and location of double and triple bonds. An alkane is a saturated molecule which does not contain any double (pi) bonds. An Alkene is partially unsaturated and contains a least one double or pi bonds. An Alkyne is the most unsaturated and contains a triple bond. This is 2 pi or double bonds between the same 2 carbon atoms. Number the chain so that you have a total lowest set of numbers. Designate the pi bond number as the lower of the 2 numbers to hit the pi bond. This molecule does not contain any pi bonds. We can number from the right or left for a total of 5 carbons. Molecule A is named pentane. In both scenarios the pi bond occurs between C3 and C4. The pi bond is numbered as ‘3-ene’ given that carbon 3 is the lower of the two numbers containing the double bond. There are two ways to put this name together. Most professors will accept both. Ask your professor which method is preferred to ensure that you don’t lose any quiz/exam points. Notice that for the second version I pulled the number 3 to the front of the molecule. I like this method since it sounds nicer and flows better. Molecule C is a terminal alkyne meaning it has a triple bond at the very start of the molecule. Since the alkyne does not have any substituents, the end of the chain with the alkyne becomes number 1. If only nomenclature ended as above with just a first and last name. But alas, simple doesn’t really exist in organic chemistry. So let’s build on this foundation and add puzzle piece components to our so far logical approach. After highlighting your parent chain, you may find yourself staring at a carbon or two that is not yet colored. If you have to lift your highlighter to color these atoms, then they are not part of your parent chain. These atoms or groups of atoms are considered your substituents, and represent the prefix ‘Miss‘ for Miss Jane Doe. The most common simple substituents include halogens and short carbon chains. To name a halogen substituent such as F, Cl, Br, I – drop the ending of the halogen name, and replace with ‘ide’. Simple carbon branches are named similar to carbon parent chains. Panic usually sets in when multiple types of substituents occur on the same molecule. And certainly don’t try to name the entire compound in one shot. Instead, write out your puzzle pieces one at a time. In my Organic Chemistry IUPAC Naming videos you will notice that I mark off every component as I address it, by highlighting chains or circling substituents. ‘di’ indicates that there are 2 groups. 2,4 indicates the carbon atom where each methyl group occurs. But we have a problem. There are two sets (not one) of substituents present. When faced with more than one type of substituent, order them alphabetically. While it appears that dimethyl should precede ethyl, (d before e) it’s actually the other way around. 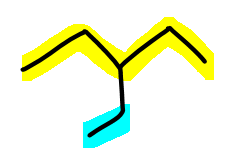 The ‘di’ in dimethyl is an adjective and is not counted for alphabetical order. Instead we look at the ‘m’ in methyl and ‘e’ in ethyl. Since ‘e’ comes before ‘m’ ethyl comes before dimethyl. This also applies ‘tri’, ‘tetra’, etc. The prefix ‘iso’ is an exception to this rule and will count as ‘i’ when considering alphabetical order. Remember that with pi bonds you have the option of pulling the pi-bond number before the parent or first name. I personally think the second version flows better but be sure to find out which version YOUR professor prefers. Use commas between two numbers. Use dashes between a number and letter regardless of which comes first. But What Happens When a Substituent Has Its Own Substituent? Now that you’re comfortable naming substituents, how do you name a molecule that has a substituent ON ITS SUBSTITUENT? In other words, how do you name a branched branch? The bad news: this process is tedious. The good news: There is an acceptable shortcut. Who Doesn’t Love a Shortcut? There are 4 very common branched substituents that you will see again and again in your organic chemistry course. Since these branches are isomers of straight-chain substituents, they will be named as an isomer of the substituent they represent. When you see ‘R’ anywhere on your molecule, recognize that this represents the Rest of the molecule. However, to keep things simple, and given that we are not looking at that portion of the molecule, just cut it all out and draw ‘R’ in it’s place. For the purpose of branched substituents, ‘R’ will represent the invisible parent chain. Methyl and ethyl substituents are short substituents and can have no branched isomers. A propyl substituent has a single isomer as pictured. Propyl is a 3-carbon substituent. 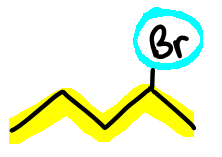 When connected in sequence (in a line) we simply call it propyl, however, when connected to the parent chain by the second instead of the first carbon, it gets the name ‘isopropyl’. Iso is a group that you will see again later so recognize that an ‘iso-tail‘ is like a mermaid’s tail or fork in the road. 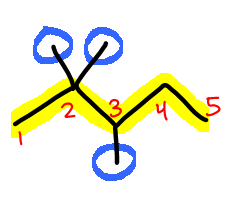 Butyl has all four carbons in a row, attached to the parent by the first carbon. Isobutyl or 2-methylpropyl has a forked or ‘iso-tail’ on a 3-carbon substituent chain. Tertbutyl or 1,1-dimethylethyl is unique in that it has 2 methyl branches coming off the first carbon in a 2-carbon chain. And finally we have our last name. Functional groups come in many forms, from the alcohol OH groups to the carboxyl CO2H. When faced with a single functional group it becomes the last name of the molecule. When faced with more than one functional group you simply choose the group with the highest priority as the last night. Visit This Table Of Functional Group Priorities for a quick review on functional group priority and appropriate last names. But let’s try a quick example. Here we have a 5-carbon chain with a CH3 functional group and CHO at the end. Note that terminal functional groups such as carboxylic acid, aldehydes and more are implied to be on the first carbon and thus requires no numerical designation. For even more organic chemistry IUPAC nomenclature tutorials, visit my website Leah4sci.com/naming for my complete 21 organic chemistry nomenclature video series taking you through the basics all the way to individual functional groups. This is so awesome! You make Ochem fun and easy to understand. Thank you for sharing. Thank you Daaimah! Glad you found this helpful! What a great way to approach the naming, and it is perfect for review before test when you thought about naming in a long time. This is a Leah4Sci study hall member who knows the rest of her methods to demystifying organic chemistry are just as effective as this one. This is an amazing introduction to nomenclature which took me, well, still takes me time to understand! I don’t think I have come across something so complete and colorful!! Thank you for sharing and for including so many additional links and videos. Amazing!! Thank you Kathy! I know how thorough you are so hearing this from you is a great compliment. This has revolutionized naming in Orgo forever. Haha, but seriously. Thank you for sharing it was very informative and helpful. thanks Ash. Are you currently in orgo 1? So how do we name something that has both double and triple bonds in the parent chain? If a molecule has a double and triple it becomes an enyne = ene + yne and follows similar rules as above for prioritizing and naming functional groups and substituents. I am a retired chemistry teacher and I have enjoyed working through your organic chemistry site. Am sharing it with my granddaughter because she is scheduled to take organic next semester. She is scared to death but I think your site will help her. I’ve never done naming for org chem before so this was brilliant. Understood it 1st time around, although it will take me a little practice before I’m completely comfortable with breaking down the names. Thank you so much for making this info available. YES!! I agree I got it on the first try. The classes move so fast that we don’t have time to think. THANK YOU so much! I totally agree with u Flor…. Nice learning here. Was showing it to my kid yesterday..
1. 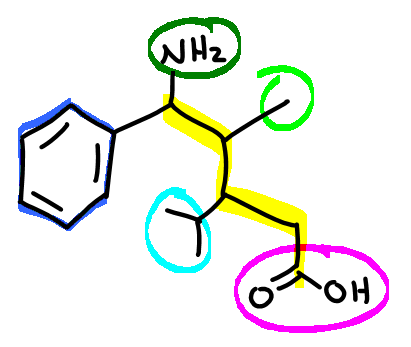 Is CH3CH2CH2CH2CN to be called Pentanenitrile or Cyanopentane ? 2. Similarly when to use hydroxy- vs -ol or oxo- vs one or carboxy- vs -oicacid or formyl- vs -al. I know one is a prefix and the other a suffix form. But how to decide if we need to use as prefix or suffix..
Wow thank you so much your comment really made my day. I’m glad you found the post useful. As for practice I recommend that as you watch the associated videos to pause when you see a question, try it on your own, and then watch to see how you did. And if you made a mistake ask yourself ‘where did I go wrong?’ master that, and then watch again to ensure you got it. Hi Leah! I love your videos and website. To check if I am on the right track the structure you have at the beginning of the article would it be 5-amino-3-isopropyl-4-methyl-5-phenylcarboxylic acid? Since carboxylate acids have priority over benzene? Seets: you are close but where is your first name to represent the 5 carbons in the parent chain? I’m taking an online chem class and the powerpoints make no sense and the professor is unavailable/unhelpful. THANK YOU SO MUCH FOR THIS POST. Jules: so glad I was able to help. How did your online class turn out? No, of course not. This is for introductory nomenclature. This is a lucid,concise presentation on organic chemistry.cant ask for more. Thanx a lot for the presentation. Thanks for this post recommended it to some friends, I just wanted to know if there were any good articles/books on using brackets when naming organic compounds for example the systematic name for Nitracaine is 3-(diethylamino)-2,2-dimethylpropyl 4-nitrobenzoate. Looking at its structure how would I know where to put brackets when naming it? How can we tell the difference between isobutyl and secbutyl? between pentane and butyl? I love to read ur posts ……. love to you, it helped likely great. that i like it. Thanx 4 clearing my doubts! tert-butyl could be named 1,1-dimethylethyl, but IUPAC prefers 2-methylpropan-2-yl. Sec-butyl can be 1-methylpropyl, but butan-2-yl is preferred. isopropyl is still ok 1-methylethyl is slightly better, but IUPAC prefers propan-2-yl. I want to correct my previous comment (I double checked the IUPAC guidance) I got one detail wrong. Rule P-57.1.2 makes tert-butyl a preferred prefix. P-57.1.3 says isopropyl is OK for general nomenclature. Rule P-57.1.4. mentions that isobutyl, sec-butyl, isopentyl, neopentyl and tert-pentyl) although included as retained prefixes in previous guidance are no longer recommended. Thank you for this. My daughter finds it really easy to understand now. You’re AWESOME ! Thank you for this very very helpful nomenclature content.I really learned from it better than my coaching. But i have a doubt, you have written-To name a halogen substituent such as F, Cl, Br, I – drop the ending of the halogen name, and replace with ‘ide’. and then you named the compound write below that statement as- 2-bromo pentane. My question is why did you used bromo instead of bromide? Woohoo!!! I really understood this concept before , this was so hard for me but now after reading this I understood this concept very easily thankkuhhh soo much for this.